I haven't looked at it for a long time (so might be a bit out of date regarding residential buildings) but it has always struck me that Late Minoan I Zakro in eastern Crete is peculiar in this regard, with the palace below the many houses up on the northeast hill behind. 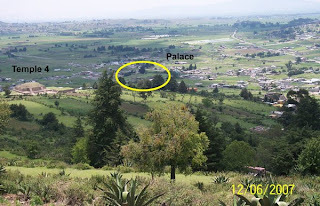 As I wrote in 1983 (The Zakro Master and His Place in Prehistory, 5,6), 'the palace lies lower than these buildings and no prince wishes to be look down upon by outsiders. One could go further and declare simply that no prince likes to be looked down upon. Thessalonica, but the deep shoreline near the hill was the primary draw. Regardless, Cassander built the walls , even at the acropolis, at a point where they were commanded by the upper reaches of Mt. Kissos. There's another coastal/sloping city North of Ephesus, if memory serves, but I can't remember which one. Can you provide citations for plans of the setting? Βακαλοπουλος, Α., «Ιστορια της Θεσσαλονικης» Θεσσαλονικην Φιλιππου Βασιλισσαν, p.239-266. Archaeological Museum of Thessaloniki and University Studio Press. Thessaloniki, 1985. 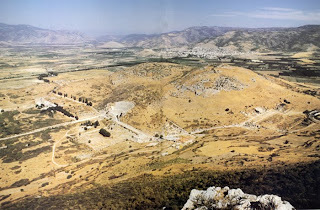 Touratsoglou, Ioannis, Macedonia: History, Monuments, Museums. EKDOTIKE ATHENON, 1999. Vickers, “Therme and Thessaloniki.” Θεσσαλονικην Φιλιππου Βασιλισσαν, p.232-238. Archaeological Museum of Thessaloniki and University Studio Press. Thessaloniki, 1985. Vickers, M., “Hellenistic Thessaloniki.” Θεσσαλονικην Φιλιππου Βασιλισσαν, p.486-499. Archaeological Museum of Thessaloniki and University Studio Press. Thessaloniki, 1985. Vickers, M., “Towards Reconstruction of the Town Planning of roman Thessaloniki.” Θεσσαλονικην Φιλιππου Βασιλισσαν, p.466-476. Archaeological Museum of Thessaloniki and University Studio Press. Thessaloniki, 1985. Also, from my notes, you might google Priene. 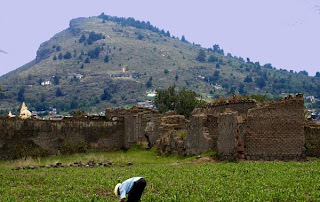 And I clipped a topo plan of Olynthus that shows an old city considerably downhill from the hellenistic enlargement, which ran up to the peak, 40m higher. www.MinoanAtlantis.com) which gives a good idea of the palace location and some of the settlement. Also see http://www.stoa.org/metis/cgi-bin/qtvr. As I said, I'm not really up to date so can't cite recent plans in print.